A group of river safety ambassadors descend from Hoyt's Trail during an impromptu river safety training day on the South Yuba River near the Highway 49 bridge Thursday. Equipped with full snorkel masks, a group of river safety ambassadors, including Katrina Schneider, a volunteer who works with SYRCL on river safety issues, scope out the safety of a popular swimming hole with an underwater tunnel before swimming through near Hoyt's Crossing Thursday afternoon. 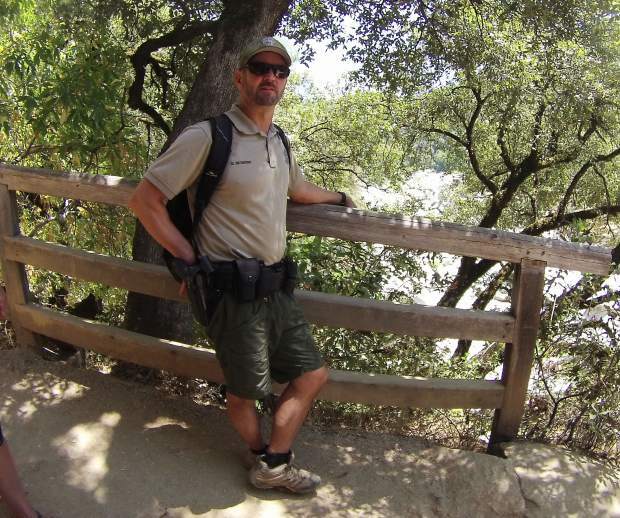 State Parks employee and Nevada County search and rescue's Marc Wetherbee keeps an eye on those playing in the waters of the South Yuba River, from the old Highway 49 bridge Thursday. River safety ambassadors discuss what type of safety hazards they will look for before rock jumping or swimming through underwater tunnels. A group of boys enter the South Yuba equipped with full snorkel masks to inspect any dangers that may be lurking under the water. 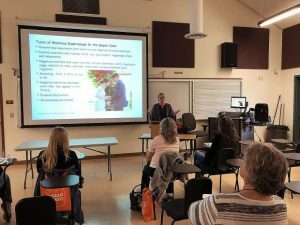 Katrina Schneider, a volunteer who works with SYRCL on river safety issues, discusses some of the main concerns she would like people to know when it comes to recreating safely in the South Yuba. LOOK: Look before you leap. The river changes. Boulders shift. Obstructions may be in former swimways. Scout first! Look for safe landings and swim routes with a mask. Scout routes from the downstream end first (especially tunnel passages), so current can’t pull you in. Always scout before rock jumping. GRIP: Watch your footing. Yuba granite is smooth and slick and wet rocks are especially slippery. It’s easy to lose footing when hopping rock to rock. Use three points of contact when rocking across rocks. PROTECT: Can you see what lies below? Moving water is powerful, and entrapments are often hidden. People can die from entrapments in less than 18 inches of water. If you end up in a precarious situation, protect yourself — “ball up” (tuck arms and legs in to the body) to avoid entrapment. 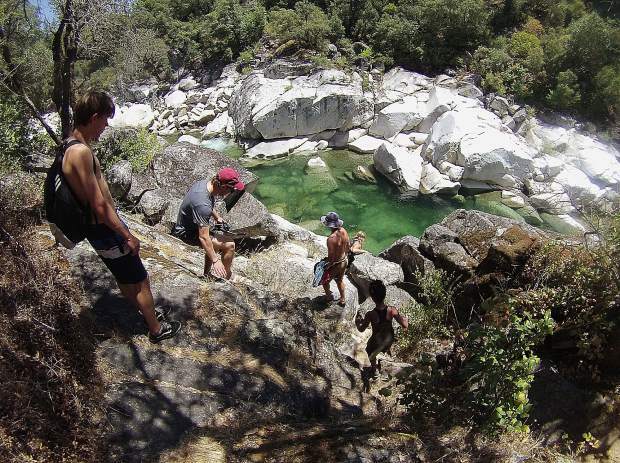 Two recent drownings in the same location on the South Yuba River have many in the community questioning what kind of safety measures can be put in place. Christian Cotter, an Elk Grove resident, died on June 5, while Mario Benassi drowned June 26. Both men had been going down the river and over rapids feet-first, authorities said. In both cases, the men became trapped underwater after they went over a 4-foot waterfall downstream of the Highway 49 bridge. After each drowning, it seemed, there were calls to stay out of the water until July, to remove obstructions from that particular area of rapids or even just to post warning signs at that spot. But, say river advocates and law enforcement officials, such measures could actually be counter-productive. After all, the river changes constantly, from year to year and even day to day. And warning visitors away from one area could lead to a false sense of security and the impression that other areas of the river are safe to swim when, in fact, they present similar types of dangers. 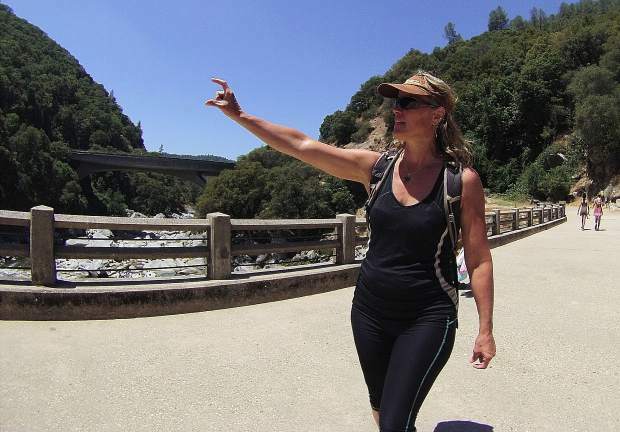 Just this week, said river scientist and river skills teacher Katrina Schneider, she and Gary Reedy scouted the South Yuba upstream from Jones Bar and found dangerous obstructions that had not been there the year before — such as two boulders at the bottom of a popular water slide above Hoyt’s Crossing that could cause a pinning situation for unwary swimmers. Swiftwater-rescue trained whitewater kayaker Matthew Machu noted in a comment on The Union’s article about Benassi, the small waterfall where Benassi died has a large boulder at the base, with other rocks likely wedged between the underwater current and the boulder, creating sieves. Such a hazard is not atypical of the river, however, making “reading” the river essential, Machu wrote. 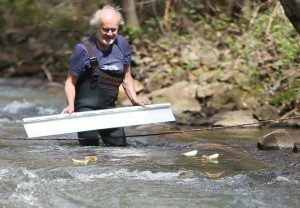 Schneider agrees that river literacy is vital — and says visitors to the river can be taught how to play safely. Schneider started running “immersion camps” on the Smith River in 2006 to teach children to “speak” river. 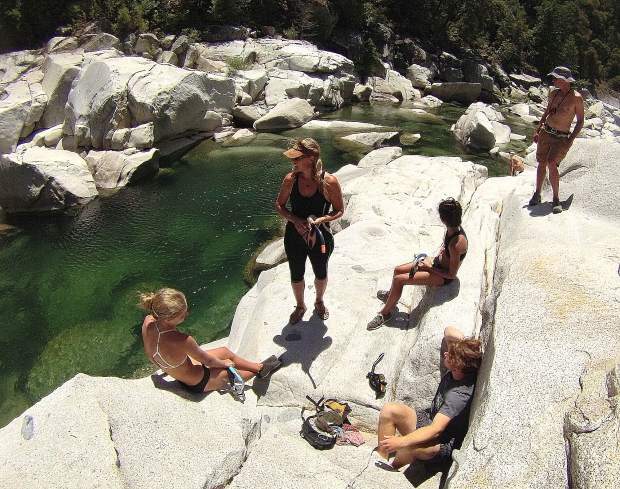 In 2013, she expanded her offerings to Nevada County, running a pilot camp on the Yuba. In 2014, she led two-day camp sessions for youths ages 12-17 in late June and early July and also taught a one-day adult immersion class. Schneider’s goal over the years has been to teach river visitors that they can play and be safe at the same time. 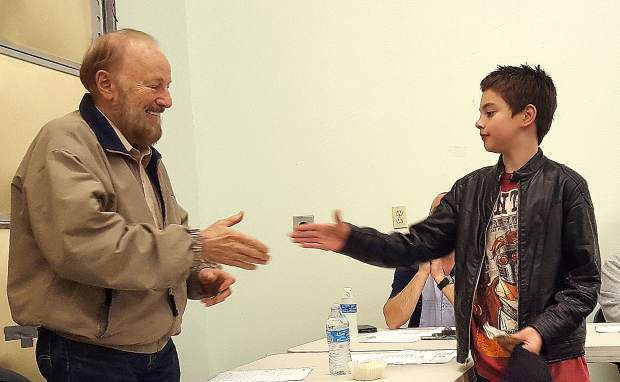 Schneider has played around with the idea of pushing for river safety certification for our community’s youth — on a voluntary basis, of course. “We get a license to drive a car,” she pointed out, suggesting that parents encourage their teens to get “river-certified” before allowing them to go to the river without adult supervision. Schneider — and law enforcement personnel well-versed in river rescues — advocate being hyper-aware of current conditions at the river. 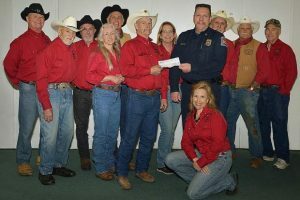 After all, noted Nevada County Consolidated Fire Capt. Kevin Menet, the river today will not be the same river as last week or a few weeks ago. The hydrology changes daily. And, although it seems counter-intuitive, the river can be even more dangerous with lower flows. At high flows, most people recognize the dangers involved. But lower flows mean that snags and places where you can get your feet trapped are more accessible to unwary swimmers, Menet said. Like Schneider, Menet stresses the importance of scouting out the river before jumping off that rock or expecting to go through that chute that was so much fun last year. And, Menet said repeatedly, don’t put your feet down when you’re in a swift current. If you do get into a situation where you are being pulled down into an area where there are potential entrapments, Schneider recommends “balling up” — tucking arms and legs in to the body. Once you are out of a strong current, you can roll onto your stomach and swim for shore, Menet said. You’re not going to be able to keep people out of the river. So how can they select a place to play at the Yuba and what should they be aware of? Schneider suggests choosing a big area to swim, being at the upstream end of a pool and staying away from the downstream/tail end.